The morning of Sunday, December 7, 1941 proved to be clear with just a few clouds scattered above the Hickam Field/Pearl Harbor area. It would be extremely hot by 4 p.m. in the afternoon, the time scheduled for our Sunday parade for that month. During breakfast the cadets sitting at my table were all discussing the parade, for the competition between companies would be keen this year. It meant a lot to me as I was assigned to lead my squad for the competition from my company. My classmate, Rowland Melim, and I were dining room orderlies for that month and therefore responsible for checking to see that each assigned waiter cleared their table of the breakfast meal and set up for lunch before being released to return to their dormitories to prepare for 10 a.m. church service as well as to get their uniforms ready for the parade. After Rowland and I secured the Dining Hall we each headed toward our respective dormitories. I lived in Kamehameha Dormitory and as I crossed Mauka Field my thoughts dwelt directly on the fast approaching afternoon parade and my role as the squad leader in the important competition. The rest of my company was expecting me to win. Upon reaching the Assembly Hall at the end of Bishop Hall I clambered atop the wall in front of the hall as was my custom every morning and I gazed at the view that stretched out before me. My eyes picked out Diamond Head, Waikiki Beach and the numerous sailboats in the ocean, Punchbowl and the important places in downtown Honolulu. Then past Aloha Tower where I could see two freighters waiting outside of the entrance to Honolulu Harbor for a pilot to come and lead them into the harbor and to dockage. Finally my eyes came to rest on the runways of Hickam Field. I hoped to see some planes “taking off,” but was disappointed because none were leaving although many of the aircraft were parked in rows before the hangars. Glancing past Pearl Harbor and the ships parked there, my gaze took in the Ewa plantation sugar cane field and the Waianae Mountain range that stretched beyond. At that moment my eyes were attracted to a glint of sunlight that reflected from either a mirror or metal sheet from in the northerly direction just above the Waianae Mountains. Looking closely, I noticed formations of planes arranged in the traditional “V” flight configuration approaching toward the patch of clouds over the Hickam Field/Pearl Harbor area. Suddenly when the formation of planes reached a point above the cloud mass, they started to dive single file through the clouds toward Hickam Field and Pearl Harbor. The previous week we had watched some of the Joint U.S. Service maneuvers being conducted to include the mock bombing of Honolulu Harbor by planes from our aircraft carriers. After the exercise they usually landed at Ford Island in the middle of Pearl Harbor. At first I assumed that these were our returning U.S .planes, but imagine my surprise when puffs of dust rose from the ground under the swooping planes at Hickam Field and the sounds of explosions rent the quiet Sunday morning. This was at exactly 7:55 a.m. on December 7, 1941. “This is the real thing. This is war. Pearl Harbor is under attack. Several planes have been shot down and they bear the insignia of the ‘Rising Sun’ on their wings.” Over and over came the message and the full significance of these words hit us all. Thoughts of an afternoon parade were given up as we might not hold another drill if the Japanese succeeded in capturing these islands. The gunners aboard the ships did not have time to set the time fuses on the anti-aircraft shells and were just hoping that when they fired the guns that the shells would hit an aircraft of the enemy. However if they did not hit an aircraft the rounds would come back to earth and in many cases our own returning rounds would detonate upon impact and kill or injure civilians in Honolulu. As we stood listening to the car radio we suddenly heard a loud whistling sound, the PMS&T shouted “Hit the ground!” As he dove to the ground in his suit we immediately followed his example. Luckily we did for two friendly anti-aircraft shells hit the wall about 100 feet up the road knocking a large hole in the road retaining wall and scattering shrapnel over the area. Within seconds several other errant rounds were landing on the hillside above and below the school itself but none of them ever came as close as the two that struck the retaining wall. By this time all the dormitory windows on the ocean side of the six living groups were filled with students leaning out or even sitting on the narrow window sills, all trying to watch the battle taking place. Right after the two anti-aircraft shells landed on the retaining wall and surrounding hillside the PMS&T ordered all students and school personnel into the basements of the reinforced concrete dorms. It was here that most of us sat out the rest of the attack with the radio as our only means of outside contact. I was one of the lucky few on the school rifle team who was assigned to security outside to make sure everyone stayed inside the basement area of each dormitory. Because of my job assignment I was in a position to see the climax of the attack that came about 25 minutes after the start of the battle. When a terrific explosion occurred the ground shook and an immense pillar of flame and black smoke burst upward from Pearl Harbor. Everyone in the dormitory basements immediately ran out to see this catastrophe. We all thought at first that the oil tanks had been hit but I could see that it was one of the battleships, the Arizona, which had exploded. We later learned that the Arizona, after exploding, had broken in two and sank, taking 900 officers and men to the watery grave. Also nearly all the ships in Battleship Row had been sunk or badly damaged. None of the US aircraft carriers were in Pearl Harbor at the time but were maneuvering out somewhere in the Pacific and did not get into the battle. About 2 p.m. in the afternoon PMS&T Mahikoa ordered all members of the school’s rifle team to report to him. As a member of the rifle team I reported as directed. We were told that because of possible invasion of the islands by the Japanese, we would be assigned duties to guard the girl’s school area, the school water tanks above the campus and the trail between the tanks and the school campus. 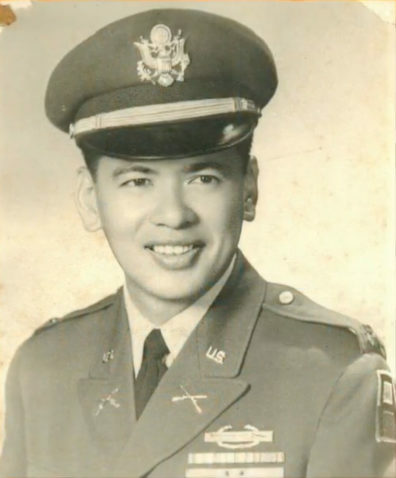 He also advised us that all the ROTC weapons in our armory had been taken for use by the Honolulu Territorial Guard, currently being organized to man the beaches around Oahu and to protect against possible landings by Japanese invasion troops. Without our ROTC weapons to use on our guard missions we would have the .22 caliber rifles of the school rifle team, some 12- and 16-gauge shotguns and other personal weapons that the Kamehameha teachers and staff possessed. We were put on shifts of two hours with two students assigned on each shift to guard the important water tanks, an assignment I received. I was assigned to guard the area above the water tanks and my companion had the area below the tanks to guard. Guarding during the first afternoon shift was fine but when night came we could imagine that there could be an enemy behind each swaying bush and tree. Then when an announcement was made of possible enemy paratroopers being dropped in the hills to disrupt and take over facilities such as our water tanks, it increased the tensions. Soon my companion guard and I found ourselves with our backs against each other as we tried to do our water tank guard duty. About midnight the rains came and soaked us to the skin as we had no raincoats. All that night and the next we didn’t dare close our eyes for a minute while on our two hour guard shift. Guard activity went on for several weeks and other students were rotated in with the rifle team members. The fear of invasion disappeared after several months with the arrival of the regular military troops from the mainland. The experiences of the December 7th attack and ensuing weeks of guard duty will always be remembered.